Dell Inspiron i3847-4461BK is a new 3000 series desktop with a powerful Haswell Intel i3-4150 processor, 8GB system memory, 1TB hard drive with ability to expand as you go easily, Windows 7 operating system and a decent variety of connectivity ports: It offers great performance levels in a relatively small design at an affordable price. Dell Inspiron comes with the 4th generation Intel Core i3-4150 processor (3MB Cache) at 3.5 GHz speed, 8GB (2 x 4GB) Dual Channel DDR3 RAM at 1600 MHz, 1024GB Serial ATA at 7200rpm rotating speed 6GB/s hard drive and 64-bit English Windows 7 Home Premium OS.. The size of memory is perfect for multitasking, you can edit multimedia while keeping tens of browsers open and listen to music and you will not experience any significant lagging in performance. Hard drive size is great especially for those that need plenty of storage space and 7200rpm speed means it offers great read and write speeds. Pocket Cloud 2.0 offers the remote desktop feature to give you the ability to access your desktop from a smart phone or a tablet as well as Explore and Web options to see, arrange files and share them through email or social media from the 2GB of free Could based storage. Intel i3-4150- released in quarter 2 of 2014 is a modern dual core processor with Hyperthreading function that lets two cores handle four threads in parallel and no Turbo Boost but 3.5 GHz is already quite a lot of speed for any processor. 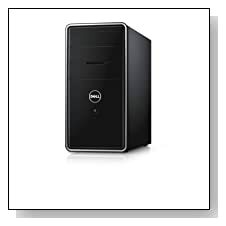 Black Dell Inspiron has the measurements of 21.93 x 14.88 x 19.25 inches which means it is quite compact for a desktop PC. It doesn’t come with a monitor but a Dell USB entry keyboard and an optical mouse (both wired) which are comfortable enough but you can always upgrade to a wireless keyboard and mouse if you wish. Intel HD 4400 is the integrated graphics card that shares the same memory with the Intel Core i3-4150 processor and is 20-30% faster than the Intel HD 4000 and matches the discrete Radeon HD 7550M in performance. The Inspiron doesn’t include any speakers but an integrated 5.1 Audio for decent sound performance from your monitor or external speakers. For connectivity you have the Tray load DVD Drive, Dell Wireless-N 1705 802.11bgn for fast internet access, Bluetooth 4.0 tied to wireless card to link to Blutooth enabled devices without wires, 10/100/1000 Network Gigabit Ethernet with RJ-45, 8-in-1 Media Card Reader to hook up your camera and other devices to transfer files from, 4 x USB 2.0 ports, 2 x USB 3.0 ports, a VGA port to connect to monitors, an HDMI port for HD and even Full HD quality video and audio transfer to your HDTV with a single HDMI cable and view your laptop screen on your large screen TV, Mic and Headphone Jacks (front) and 3-stack audio jacks (rear). Conclusion: Dell Inspiron i3847 is a powerful desktop computer that is very simple to set-up (with little bloatware and just the trial versions of MS Office and McAfee) and use in day-to-day or a little more complex tasks at home or work with decent specs and features including generous amounts of memory and hard drive, Windows 7 operating system rather than the much criticised Windows 8 and the ability to upgrade easily later on when you need it. This is not a high level gaming computer as you can imagine at this price level and it will handle some of the latest games at lower settings as well as older titles at higher settings. It is powerful enough for pretty much everything else that you’d do on a daily basis. 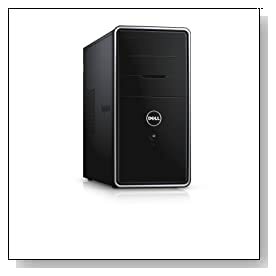 It has the standard 1Yr In-Home Warranty that is offered standard with the Dell Inspiron 3000 series desktops.